A forest of sculptures of nature! One of the most spectacular and fascinating regions in the world! In Central Greece, Thessaly! High and steep rocks in an area of thirty sq km; cut off from the surrounding mountains, damp from the morning mist, sculpted by the wind. A forest of nature’s sculptures. 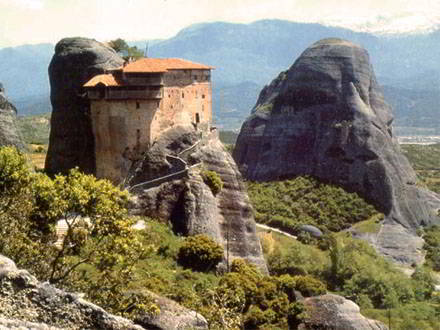 Monasteries on top of the rocks, a monastic settlement with a history of over one thousand years. Thousands of visitors come from around the world throughout the year to admire the incomparable landscape created by nature and man. Meteora is included in the UNESCO list of world cultural heritage monuments. The Greek State has declared the area as a place sacred, inviolable and unchangeable. The monasteries in harmony with the environment are a natural extension of the rocks. Today, six can be visited. Another two have been restored. But there are also ruins of other monasteries among the rocks. In addition to a place of worship, Meteora is one of the best climbing areas in the world. Hikers come to discover the trails between the rocks and climbers to meet the challenge of the steep slopes to craggy peaks. Visit this unique, impressive and charming place with us. Meteora is located in the northwest of Thessaly, near the town of Kalambaka, between the mountains of Antichassia in the north, Chassia to the northwest and Pindus to the west. Kalambaka is the passage to all surrounding areas; west and northwest to Epirus, north to Macedonia, south and east to Thessaly and further south to Central Greece. Smaller roads around Kalambaka lead to other beautiful natural and traditional areas; especially in the west, the slopes, rivers and villages of southern Pindus. Kalambaka - and nearby Kastraki - is the gate to Meteora. It can be reached by road and rail. -	142 km from Volos and 82 km from Larissa. -	352 km from Athens. -	237 km from Thessaliniki and 54 km from Grevena. -	57 km from Metsovo, 172 km from Ioannina and 246 km from Igoumenitsa. -	219 km from Patra. In Kalambaka take the Trikala KTEL bus. Trikala and Kalambaka are connected with twenty bus services on weekdays from 05.15 to 22.30 and eleven during the weekend from 05.15 until 22.30, too. Further, there are buses that stop in Kalambaka en route to Ioannina. 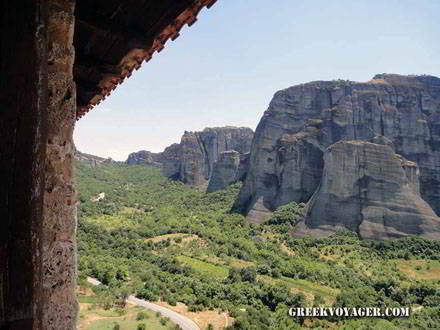 From Kalambaka there is a bus to Meteora at 09.00 and 13.00. The town of Trikala is connected by bus to Athens, Patra, Arta, Prevesa, Ioannina, Karditsa, Volos, Larissa, Thessaloniki and Grevena. Hellenic Railways (OSE) connects Kalambaka with the other train stations every day. We have to change train at Paleofarsalos station. For the exact route planning you can visit the Railways onlive ticketing web site. Kalambaka and Kastraki welcome thousands of visitors, especially in summer. There are hotels of all categories, traditional hostels, rooms to let and great camping sites. Many restaurants and taverns serve food to suite all tastes and local dishes; the area is famous for meat and traditional sweets. In cafes and bars. relaxation and fun. There are many shops covering all needs. Also, shops with folk art. Thessaly is located in the center of the Greek mainland. It has an area of 13,929 sq km. It is a great plain, a basin that once was a lake. During the geological evolution, the waters found an outlet between the mountains Olympus and Ossa to the east and created the valley of Tempe rolling towards the Aegean Sea. The plain of Thessaly is enclosed by mountains. To the west Pindus (2.249m. ); to the north Chassia (1.565m. ), Antichassia (1.416m. ), Kamvounia (1.615m. ), Titaros (1.837m.) and Olympus (2.917m. ); to the east Ossa (1.978m. ), Mavrovouni (1.054m.) and Pelion (1.584m); and to the south, Orthrys (1.726 m). Thessaly was divided by a range of low mountains. Initially, it was divided into two lakesand when the water flowed through the Tempe valley, into two fields; the plain of Larissa to the east and the plain of Trikala - Karditsa to the west. Since antiquity the Thessalian Plain was nourished by the Peneus River, flowing from Pindus to thee Aegean Sea, creating fertile lands. 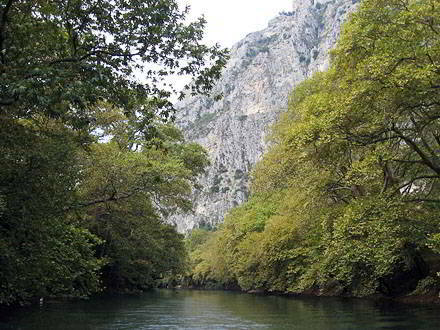 Peneus is the third longest river in Greece following a route of 205 km and a river basin of 10,700 sq km. Its sources are in the Lakmos mountain of Pindus, near the boundaries of Epirus and Thessaly. How were these rocks formed, called the "towers,” by the locals? How was the amazing geological landscape of Meteora created? Many geologists and historians have long sought the answer. A completely documented explanation has not yet been given. The only certainty is that there is no information from ancient sources. There are no references by ancient Greek historians or other historical references. Even Mythology does not refer to the subject. 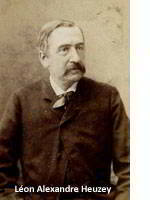 Of the theories on the creation of the rocks, the most acceptable, even today, is the late 19th century supposition proposed by the German professor of geology Alfred Philippson. Alfred Philippson researched the geological evolution of Southeast Europe, visited Greece and gave the name Aegeis to the area in prehistory which later emerged geologically as the Greek land and the Aegean Sea. According to his theory, at a time when Thessaly was covered in water, large stones and limestone rocks from a large river fell into the water. From these materials, a compact deltoid cone was created, which rose with successive geological changes. Subsequently, when the water dispersed, it remained in place. During the Tertiary Age, when the Alpes and other mountains including the Pindus range were formed, the cone was cut from the solid mass and broke into smaller cones creating the valley of the Peneus River in between the cone fragments. Thessaly was always the passage for invaders and conquerors coming from north to south and the rocks offered protection to local inhabitants. It was not easy to climb the slopes to the top. However, the caves, fissures and, more importantly, the peaks provided the ideal environment for the ascetics of Christianity seeking isolation to devote themselves to prayer, a frugal life and hard work. It is not known exactly when the first ascetics arrived. Written sources exist since the origins of monastic life. According to tradition, the first hermits came in the 10th century. Varnavas is considered the first hermit and founded the Cloister of Aghion Pnevma (Holy Spirit) in 950-970. The Cretan monk Andronikos followed in 1020; he founded the monastery of Metamorphosis (Transfiguration). In 1160 the Cloister of Stagi or Doupiani was founded. TThe first ascetics lived isolated in caves and prayed in small churches, the "prosefchadia" (places of prayer), as they were called. Gradually other cloisters were founded and a small community of hermits developed in the early 12th century. The center of worship was a small church of the Virgin Mary, the "Kyriako" (of Sunday) or "Protato" (First place) to the south of the rock Doupiani. In this church, the ascetics gathered to celebrate the cult, discuss their problems and ask for help from one another for hard jobs. The head monk was from the Cloister of Stagi or Doupiani and had the title of “Protos" (the first) and Abbot of the Monastery of the Virgin of Doupiani. The church of the Virgin still exists. The Cloister of Stagi in the 12th century was the first organized monastic community of Meteora. Two hundred years later, in the mid 14th century, Nilos, the First of the Cloister, reorganized the community to protect itself from robbers who had begun raids. Shortly afterwards Saint Athanasius, one of the most important figures of Christianity, left Aghion Oros (Holy Mountain) in Chalkidiki and came with fourteen monks to Meteora. He settled on the rock “Platys Lithos” (“Wide Stone") and founded the Monastery of the Transfiguration of Christ. When he arrived in 1344, he named the rock “Meteoron” ("Meteor"). 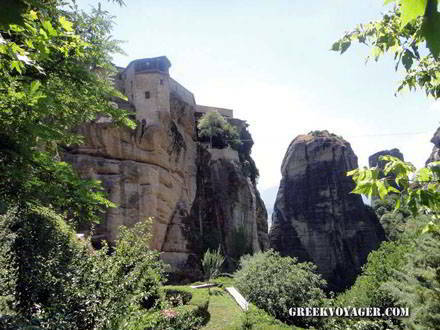 Since then, the entire area including the rocks and monasteries is named Meteora. Athanasius the Meteorite organized the communal life of the monks and established monastic dictate according to the standard of the Holy Mountain. Since then, the monasteries of Meteora have functioned according to this dictate. The first hermits climbed the rocks using scaffolds which were based on beams wedged in the rock. With time, ropes and rope ladders were used. Afterwards, towers were built and pulleys were used to go up and down a net. 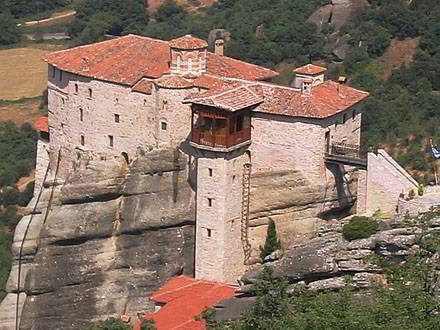 The 14th and 15th century was the first period of prosperity of monasticism in Meteora. By then, the monasteries had reached twenty-four. The decline of the Byzantine Empire also affected the life of the monasteries. In 1393 Thessaly was conquered by the Ottomans and after the fall of Constantinople monastic life spiraled into decline. In 1521 or 1524 the Chronicle of Meteora was written. At that time, most of the twenty-four monasteries had disappeared. But the metropolitans of Larissa, Vessarion A, Markus and Vessarion B managed to reconstruct the monastic life of Meteora. A new period of monastic life flourished, which would continue into the 16th century. Monasteries were renovated, new cloisters were founded, churches and buildings were built and painted with icons of exquisite art. Also, schools for copying codes were established and many educated monks worked in copying handwritten codes. The monastic city reached its peak in the 17th century. During the Ottoman rule the Meteora was a refuge for persecuted people. The monasteries preserved important relics and works of Byzantine art and played a major role in the historical evolution of the area. The monasteries contributed greatly to education. They founded schools and, along with worship and faith, retained the Greek language strengthening the national consciousness and the desire for freedom. The monasteries were subject to negative forces following the fate of the region; conquests, raids by robbers, historical changes. The greatest disaster came in the early 19th century, when they were plundered by the troops Ali Pasha of Ioannina. The monastery of St. Demetrius was destroyed, because the priest Thymios Vlahavas, and head of the revolutionary movement in 1809, had his headquarters in the region. After the disaster, the Turks closed the monasteries, imprisoned the abbots in Ioannina and executed the priest Thimios Vlahavas. Meteora becamte a prison and a place of exile for the condemned by the Ottoman government. In the early 18th century the decline of the monasteries had already begun because of raids by Albanian bandits. One after another, the monasteries were deserted. Those that survived experienced again damage during the 1821 revolution for independence and the revolts of 1854 and 1878 in Thessaly. At that time, more and more travelers were coming from Western Europe to Greece. They traveled to the mainland and the islands and on returning published their impressions; much information on the era is due to these visitors, although many left with antiquities, relics and manuscripts. Meteora was one of the places that attracted their interest. Several of the foreign visitors to the monasteries played an important role in the preservation and promotion of the Byzantine tradition. Even those who did not view Orthodox monasticism positively, as shown in their writings, which were rather ironic relative to the monks, preserved important information. Among those who visited Meteora was the Swede J. Bjornstahl in 1779, the Englishman Lord R. Curzon in 1883, the French archaeologist L. Heuzey in 1858 and the Russian Archimandrite Uspenskij in 1859. Some were collectors of manuscripts. They bought them at extremely low prices, but, even so, preserved them. The manuscripts bought by Lord R. Curzon, for example, are now in the British Museum. Two illustrated parchment gospels of 11th-12th century, which he did not manage to buy from the Great Meteoron, are not currently in the library of the monastery and their fate remains unknown. From the 1920s steps and tunnels were carved in the rocks and bridges were built so the monasteries were easier to reach. The ropes and traditional, dangerous net gradually ceased to be used. Pilgrims could visit the monasteries and a new period began. Some monasteries were damaged during the German occupation in 1941-1944. German projectiles destroyed the dome of the church of Saint Charalambos in the monastery of St. Stephen. In the old church of St. Stephen the faces and eyes of all the saints in the icons were destroyed. Damages also occurred during the civil war of 1946 – 1949 when the monasteries were used as shelters or bases of operations. In 1948 the asphalt road was constructed, and things were simpler. At that time, women were also permitted to visit the monestaries. However, a decent dress code for both men and women is required. Over the years Meteora attracted increasing interest. And, beginning in the 1970's, for another reason. The first foreign climbers discovered the charm of the rocks and established the first tracks. 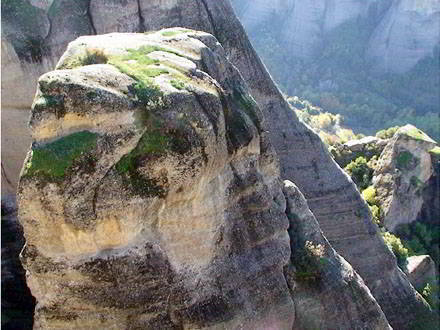 In a few years Meteora became a famous climbing area. Today there are six monasteries. The Holy Monastery of the Transfiguration or Great Meteoron. The Holy Monastery of Aghion Panton (All Saints) or Varlaam. The Holy Monastery of St. Stephen. The Holy Monastery of Aghia Trias (the Holy Trinity). The Holy Monastery of Aghios Nickolaos Anapafsas. Since the 1960s restorations and other maintenance began in the monasteries. Walls were fixed, buildings were restored and icons were cleaned and preserved. Also two ruined monasteries were preserved and restored. The monastery of Aghios Nickolaos Bantovas, dependency of the Monastery of Holy Trinity, and the monastery of Ypapante, with beautiful icons, dependency of the Monastery of Great Meteoron. The effort to restore other monasteries has not stopped but it is an expensive work. The monasteries are admired for the way they are built according to the configuration of each rock. The visit to each monastery is a unique experience. The architecture is exceptional and churches have wonderful murals and woodcarvings. There are important relics – icons, silver and gold works, embroideries and other works of art. Many manuscripts, publications and documents are also kept. The manuscripts come from either the copying manuscripts laboratories, operating in the monasteries, or from collections bequeathed to the monasteries by scholars who became monks. The six monasteries can be reached either by car or on foot. Tourism has added to the work of the monks including the reception and tour of visitors. The monk in charge of the reception is called “archontares”. 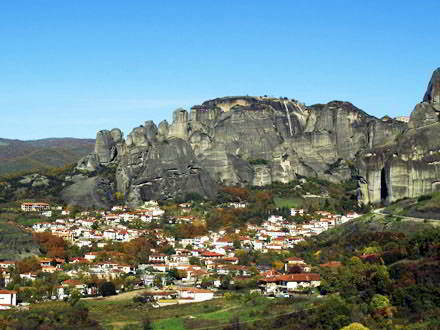 The town of Kalambaka and nearby is the smallest Kastraki, the gate to Meteora. 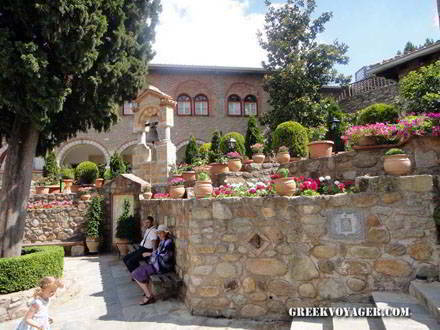 Kalambaka is located northwest of Trikala, at an altitude of 240, at the foot of the rocks, near the river Peneus. Kastraki at an altitude of 270 is next to Meteora. Kalambaka is traditionally an important transportation hub. It is also the starting point for journeys to beautiful mountain landscapes in the north to the mountain Chassia and in the west to the slopes and peaks of South Pindus. Close to Kalambaka in antiquity was the city Aeginion. Archaeological remains exist in the area of Xerokambos. 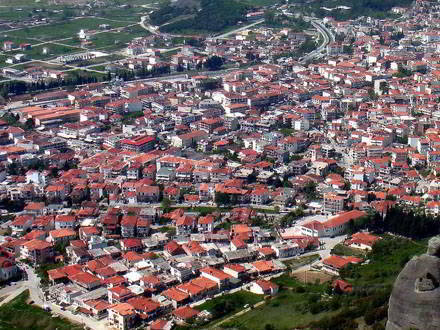 Kalambaka is a continuation of the medieval city Stagi, first mentioned in the 9th century. The name Kalambaka appeared at the end of the Ottoman rule. The name Stagi still exists in the title of the ecclesiastical metropolis of the region. On the northeastern side of Kalambaka, is the picturesque old neighborhood of Sopotos under the shadow of the cliff Alyssos (Chain) on the left and the cliff of Aghia Trias (Holy Trinity) on the right, there is one of the most beautiful Greek churches; the Assumption of the Virgin, cathedral of the medieval town. It’s a three aisled basilica, built in the 11th century. Its characteristic is the unique marble pulpit, the only one in Greece, at the center of the church. In this historical monument, of special interest are the icons; a few from the 12th century and more from 1573, the work of Neophytos, son of Theophanes Strelitzas, the great painter of the Cretan School. Of particular interest is also the Cathedral of Saint Vessarion with beautiful icons. 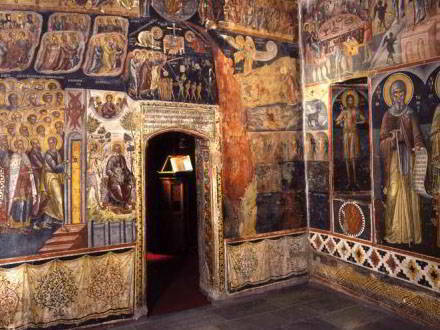 Murals and wood carved temples are in small churches from the Ottoman era. 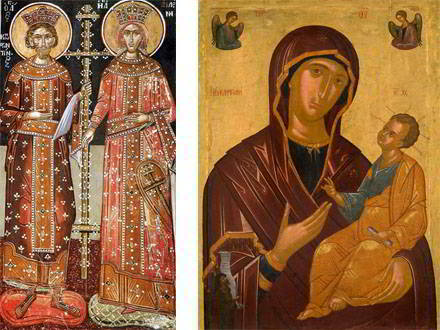 The increasing number of visitors to the monasteries led to the development of the art of icon painting. It also operates a school of woodcarving and furniture decoration. On the road from Kalambaka to Kastraki is a folklore exhibition with a photo collection of the well- known photographer Costas Balafas on the life of monks. There are also traditional products of the region, folk costumes, old tools and more. Kastraki is located two kilometers to the north, joined with Kalambaka at Stavros. It is the passage to Meteora. It has its own tourist facilities for accommodation, food and service. One of the nice walks starting from here is in the Old Kastraki, traditional village with beautiful stone houses. On the road, to the right, is the rock “Ambaria” (Holds). Here are the “ambaria”, caves used in the past by residents as warehouses. The name Kastraki came or from a Byzantine castle, which existed at that time, or from the fact that the huge surrounding rocks protect the small town as a natural castle. 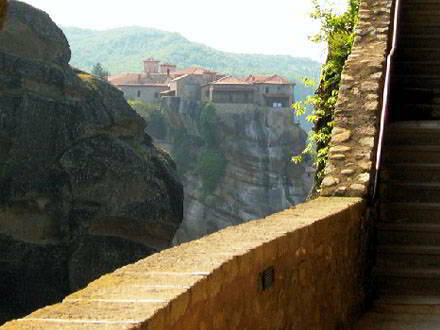 We can visit the six monasteries of Meteora by car and on foot. By car the total distance is 18 km. 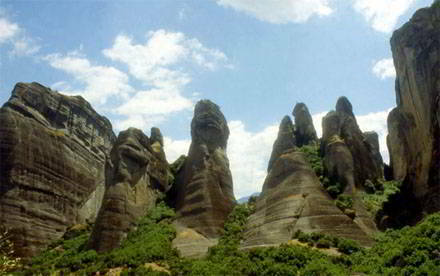 Many travel agencies organize the "round of Meteora." On foot we must follow the paths marked on the rocks for years. Nature has created three groups of rocks. The first group is located on the north side; the rocks are tall and impressive. 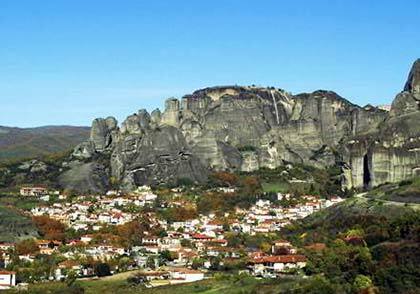 In these rocks are the monasteries of Great Meteoron, Varlaam, Anapafsas and Roussanou, and the ruins of other monasteries. On the south side are the tallest cliffs, above Kastraki, as a fortress of nature. In these rocks are ruins of monasteries and cloisters. Behind them lies the Palaiokranies ravine with lush vegetation. The other group is on the east side where the monasteries of Holy Trinity and St. Stephen are. Fewer rocks are to the west. The entrance to the monasteries is allowed in men and women, always with the attire that fits in space according to the monastic morals. If a woman does not wear a skirt, she will have one in the monastery. The Monastery of Metamorphosis or Great Meteoron (tel. 24320 22278) is closed in winter on Tuesday and Wednesday and in summer on Tuesday. The Monastery of Varlaam (tel. 24320 22277) is closed in winter on Thursday and Friday and in summer on Thursday. The Monastery of Roussanou (tel. 24320 22649) is closed throughout the year on Wednesday. The Monastery of Aghios Nickolaos (tel. 24320 22375) is closed on Friday. The Monastery of Holy Trinity (tel. 24320 22220) is closed on Thursday. The Monastery of St. Stephen (tel. 24320 22279) is closed on Monday. If we are in Kalambaka and leave by car from the Town Hall Square, we take the road to Kastraki following the signs. 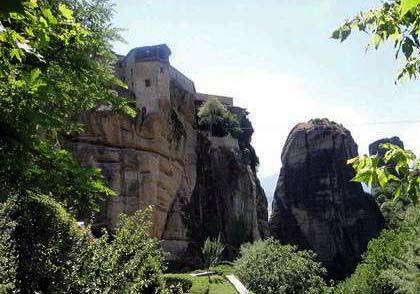 Inside Kastraki we turn left to Meteora and in three km we arrive at the Monastery of St. Nicholas Anapafsas. That is, at the base of the rock. The monastery is on top. The rock is narrow, 85 meters tall. Small compared with the rock Ypselotera (Higher) back at a height of 585 meters, and other rocks around. The plateau at the top is small. So the monastery developed up at three floors with various additions and structures over the years. It founded in the first half of the 14th century. From that era are the few frescoes in the small church of St. Anthony in the first floor. The monastery was reformed in 1510 and the church of St. Nicholas in the second floor was rebuilt, at the initiative of St. Dionysius, Bishop of Larissa, and the monk Nicanor, head of the Church of Stagi. “Anapaussas” in Greek means someone “who offers rest and tranquility”. The origin of the name remains a question mark. Perhaps it came from one of the first founders of the monastery. Perhaps is due to the position, as the monastery and the location offers physical and spiritual rest to the monks. The entire second floor is the church of St. Nicholas. Small, almost square, with corners mismatched due to space. The small dome has no windows and light, because above the third floor of the monastery was built. The narthex has more space. In the church is one of the most important sets of murals in the Greek area. The painting, completed in 1527, is the work of the great painter Theophanes Strelitzas, pioneer of the Cretan School. It is his oldest known work and with his name; below each hagiography left his monogram. As in all the monasteries, also here in the beginning the monks went up and down using a ladder. Next they used a net pulled by pulleys. The stairs were carved into the rock much later. From the early 20th century, the monastery was gradually abandoned. In the 1960’s it was restored and renovated, but it stayed with only one monk and eventually ceased to function for fifteen years. It opened only in summer for visitors with the care of the priests of Kalambaka. It began to function again in 1997. From the rock of St. Nicholas Anapafsas the road goes upwards and after five km reaches a fork. Close to the right is the monastery of Roussanou. West are the monasteries of Varlaam and Great Meteoron, east the monasteries of the Holy Trinity and St. Stephen. 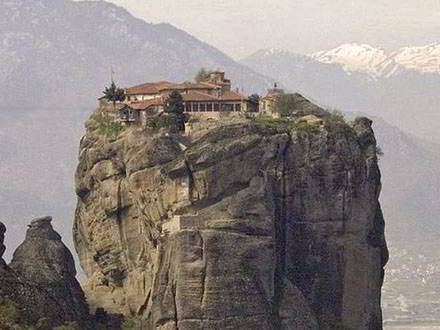 The Monastery of Roussanou is located on a rock at a height of 370 meters. It is a three storey edifice with single roof, covering the entire top. The dome of the church stands out at the top of the building. Nowadays in the monastery they live nuns. Its protector is St. Barbara. But the origin of the name Roussanou is unknown. One version says that the name came from an old hermit. Another that was built by two Russian monks, therefore «Russa-Ne." In the beginning the monks climbed by ladder; then with a net. In 1868 a wooden bridge was constructed. The bridge that brings us today to the rock was built in 1930. There is no information about the time of the foundation of the monastery. It is estimated that it was built in the 14th or 15th century. According to one version it was founded in 1388 by the monks Nicodemus and Benedict. What is certain is that it took its present form since 1530, when the brothers and monks Ioasaf and Maximus from Ioannina climbed on the rock. They built over an older church the church that we admire today, dedicated to the Transfiguration of Christ. The chapel is dedicated to Saint Barbara. CContrary to what happens in the other monasteries, here the two founders are not depicted in the murals of the church and their name is not mentioned in any inscription. The sacred place of the church is facing towards the north rather than the east, due to the morphology of the rock. The hagiographies are from 1561. The painter is unknown, but the style is inspired by the famous Cretan School. Frescoes are also in the narthex, which is covered by a dome. At the fork near the Monastery of Roussanou we turn left. In less than one kilometer a road to the left leads after two hundred meters to the Monastery of Varlaam. Continuing in one kilometer we arrive at the Great Meteoron. The Monastery of the Transfiguration of Christ or Great Meteoron stretches in sixty acres at the top of the rock Platys Lithos (Wide Stone) at an altitude 610. 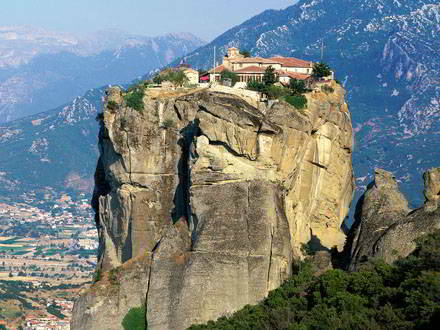 It is the largest monastery of Meteora and the first in the order of the monastic city. It is also the oldest. It was founded in 1344 by Athanasius the Meteorite. He named Meteoron the Wide Stone, so the whole area was named Meteora. The first church was dedicated to Virgin Mary. The church of the Transfiguration, from which the monastery took its name, was built later. Successor of Athanasius and second founder of the monastery was Ioassaf, named Ioannis Uresses before becoming a monk; he was the son of the Serbian-Greek king Simeon Uressses Palaeologos. Ioassaf lived here forty years. In 1388 he restored the church of Transfiguration. Among others, he built cells and was one of the founders of the monastery of Ypselotera on the rock opposite the Great Meteoron. A new important period was the 16th century. 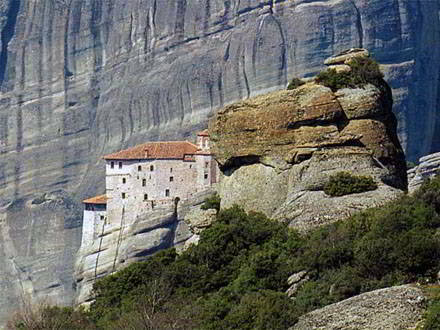 In 1545 the abbot Simeon built the great church with dimensions 60X32 m. It is the largest in Meteora. The first small church became the holy place of the great church. It has significant paintings of the Macedonian School since 1483. Wonderful frescoes are also in the main church and the narthex. There are also the old chapels of the Virgin Mary, of John the Baptist and of the Saints Constantine and Helen; also the new chapel of St. Nectarios. It takes time to visit the monastery; from church to church, from stairs to stairs, from floor to floor. The entire is a museum. The Old Dining Room was built in 1557. 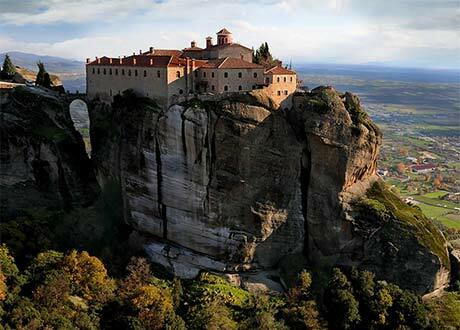 It is one of the most remarkable places of Meteora, where apart from the hall itself we admire the collection of relics and the theological gallery of the monastery. The kitchen, the cellar and the hospital-nursing home were built at the same time; also the tower for lifting the net. The library of the Great Meteoron is one of the richest monastery libraries with manuscripts and documents. From the Great Meteoron we can take the path to the west and get to the restored Monastery of Ypapante. It is closed, but beautiful in a large hollow of the rock, in the end of one hundred steps. In a relatively short distance are the ruins of the Monastery of St. Demetrius. 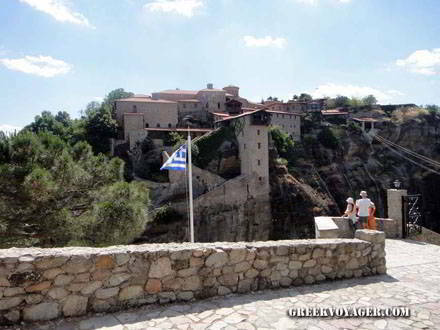 From the Great Meteoron we go back to visit the Monastery of Varlaam. In the space where we leave the car we can stand for awhile and enjoy the view. The Monastery of All Saints or Varlaam is located at an altitude of 550m, opposite to the Great Meteoron. It is the second in the order of the monasteries. It was founded by the hermit Varlaam in the mid 14th century. Varlaam built the small church of the Three Hierarchs, two more small churches, a small cell and a cistern for water. The monks climbed with four ladders hanging on poles wedged in the rock. In 1518 came the brothers Theophanes and Nectarios Apsaras, sons of a wealthy family from Ioannina. They renovated the little church of the Three Hierarchs, built the tower for hauling the net and started preparations to build a large church. The transport of the materials lasted for years. In 1541 – 1544 the church of All Saints was built. The beautiful murals were painted in 1548; most of them by Frangos Katelanos, painter from Thebes. Later it was built the narthex with murals of 1566. In the narthex are the graves of two brothers. The imposing church is like the churches of Mount Athos with two domes, one on the narthex to the west and one on the main church to the east. 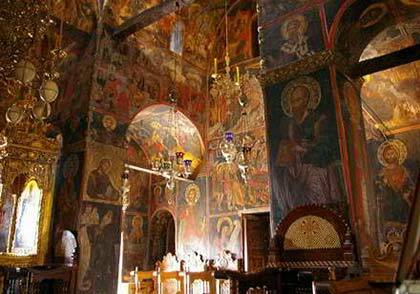 There are also frescoes of 1637 in the chapel of the Three Hierarchs, built on the first church of Varlaam. From the early 19th century climbing became easier. Steps were carved into the rock, and an intermediate bridge was constructed. Since 1923 almost two hundred steps lead to the church of All Saints. From the courtyard of the church we can enjoy the view and continue to visit the monastery. Of particular interest are the old dining room, the kitchen and the hospital-nursing house. Important is the collection of manuscripts, icons and relics. We return to the junction and continue to the other side. We find an entrance leading to the Monastery of Roussanou and afterwards we arrive at the Monastery of the Holy Trinity. 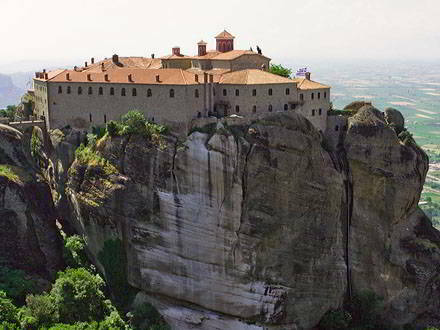 The Monastery of the Holy Trinity is at the top of an impressive cliff at an altitude of 520. The space at the top is six acres. One hundred and forty steps are carved into a narrow path of the rock since 1925 and need some strength to climb. The tower for the traditional net is the reception area. The year of the founding of the monastery is not sure. Unknown is the founder as also the first period of the life of the monastery. It is considered that it has been an organized monastery in 1362. The church of the Holy Trinity was built between 1456 and 1476. It is a small Byzantine church on the northwestern side of the rock. The narthex was built in 1689 and its frescoes were painted in 1692. The frescoes we see today in the church were created in 1741. Within a carved rock is the chapel of John the Baptist, circular with a dome. It has significant old frescoes. 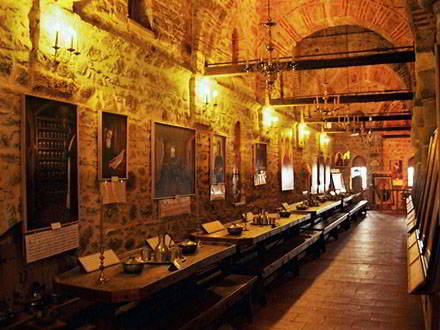 We can also see the dining room, other halls and the cisterns of the monastery. One of the activities of the monks was to copy manuscripts, not only with religious content, but also from various sciences books. In the monastery of the Holy Trinity belong 120 manuscripts, but we can not see them here. During the German occupation, the monks were evicted and the monastery was plundered and depopulated. It was closed for fifty years. The manuscripts are kept since 1953 in the monastery of St. Stephen. They remain there, because their preservation has specific demands and the monks in the Holy Trinity are few. From the Monastery of the Holy Trinity we continue towards the last rocks on this side. We arrive at the Monastery of St. Stephen. We are again close to Kalambaka. The monastery of St. Stephen is located at an altitude of 520m, but is the easiest to access. The parking is next to it but there are no stairs or bridge. The monastery was founded in the 14th – 15th century, but hermitages existed on the rock at least since the late 12th century. According to tradition the first hermit was Jeremiah and the first founder of the monastery the archimandrite Anthony. His father was a Serbian sovereign and his mother from the Byzantine family of Kantakouzene. Second founder was the monk Philotheos, who in 1545 rebuilt the small church of St. Stephen, with frescoes of 1501 and a beautiful wooden iconostasis. Cells and other buildings were also constructed. The big church of Saint Charalambos was built in 1798. It is an impressive church, cruciform, with a large dome and two small domes. The murals were painted by the great painter Vlassis Tsotsonis. The wooden iconostasis is from 1814. There are also wooden icon stands since 1836. The first church of St. Stephen was damaged during the German occupation. In the paintings the faces and eyes of the saints were destroyed. During the next years things were not going well for the monastery. But in 1961 came to live nuns and a new best period began. In the church of St. Stephen the murals are cleaned and preserved; they are a very interesting set of post-Byzantine painting hagiography. The old dining room became a museum with manuscript codices, icons, relics and gold embroideries. Of particular interest is the visit to the galley, the hostel and the other buildings, where are the library and laboratories of hagiography, calligraphy and decoration, manuscripts, gold embroidery and other activities. From the Monastery of St. Stephen we take the way back. Turning backwards we see the sign towards Kalambaka, we turn right and leave behind the rocks. If we did not have the time to visit all the monasteries in one day, now we know the way. 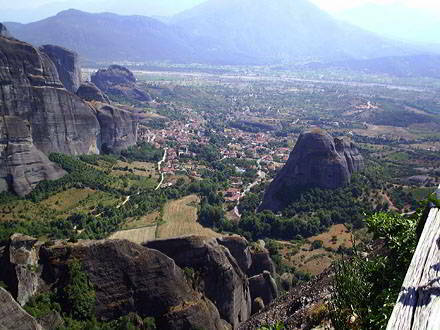 Meteora offer many and various options for hikers. Among the rocks and from their roots to their tops paths are created by nature and man. There are books and tourist guides especially about the paths of Meteora. The experts tell us that we can follow two routes to reach the six monasteries in function, but also the remains of other monasteries. The trails are not difficult despite the first impression seeing the rocks. We must, of course, be used to walking. The starting point is the square of Kastraki. The first route has a length of 10 km with the return and leads to 4 km in the Great Meteoron and from there to 2 km in the ruined monastery of St. Demetrius and the restored monastery of Ypapante. The second track has a length of 11 km. From the rock of Aghion Pnevma (Holy Spirit) near Kastraki it leads to 5 km to the monastery of Roussanou and then to the monastery of Holy Trinity and the Monastery of St. Stephen, from which we return to Holy Trinity. From there are another 6 km. We descend to the historic church of the Assumption of Mary in Kalambaka, we pass by the old monastery of St. Nicholas Bantovas and return to Kastraki. Experts suggest another route more difficult towards the tall rocks that cover like guards Kastraki; but the first destination is a low rock, the Adrachti (Spindle), at a distance of 800 meters. The Spindle has a height of 40m and a shape like what its name says. It stands out as a needle between Sourlote, Pyxari and other great rocks. The trail continues for 1.5 km to Psaropetra, the location with the most beautiful view in Meteora. The most beautiful hiking season is spring. We can hike all seasons, but not the days with rain, because the rocks are slippery. Over Kastraki rises at a height of 300 meters the rock of Aghion Pnevma (Holy Spirit) preferred by many hikers and climbers. It is one of the nicest "towers" of Meteora with historical and cultural interest. 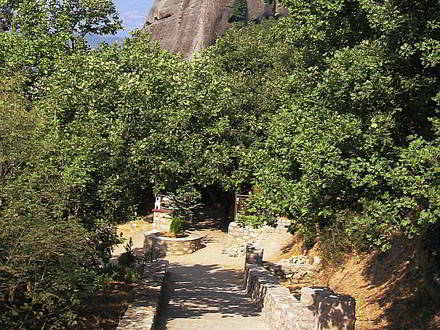 In this rock climbed Varnavas, the first hermit who came to Meteora and in 950 founded the Hermitage of the Holy Spirit. This first installation in a small cavity is about an hour walk from Kastraki. Close is the climbing path called "the way of the water"; so named because the rainwater passes and "paves" the path to the top. The old days the hermits had carved in the stone a groove, so the water fell in a cistern next to the chapel of the Holy Spirit. 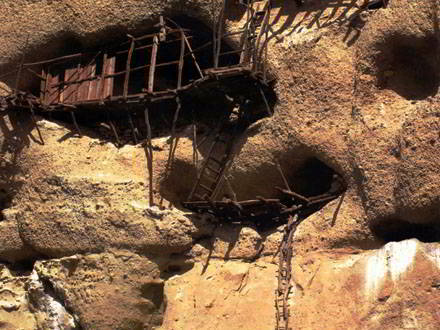 On the north side of the cliff is a cave with a height of 60m, called "the prison of the monks." Here the monks were seeking isolation. It is said that here also at one time the Turks sent exiled Greeks. On the front side of the rock, a few minutes from Kastraki, are the remains of the monastery of St. George Mandelas (Kerchief) at a height of 30m. There, in the ruins, all year kerchiefs are waving according to an old custom. Once a Turk went to cut wood in the forest below the monastery, but a tree trunk fell and injured him heavily. His wife devoted her kerchief to St. George to save her husband. So it was. 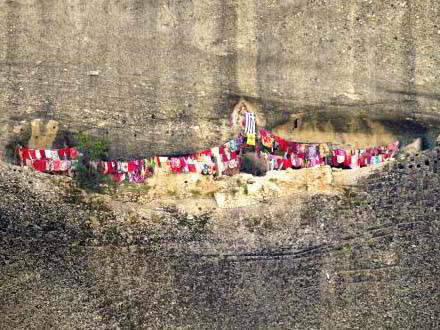 Since then, every year on the feast of the saint on April 23 or Monday after Easter the young people of the region climb up, take the kerchiefs left the previous year, hang new kerchiefs and coming down they give the old as talisman to those watching at the roots of rock. Something similar happens on the feast of the Holy Spirit. Young people climb on the rock and change the kerchief set the previous year. Near and opposite, is another rock with great interest; Doupiane. 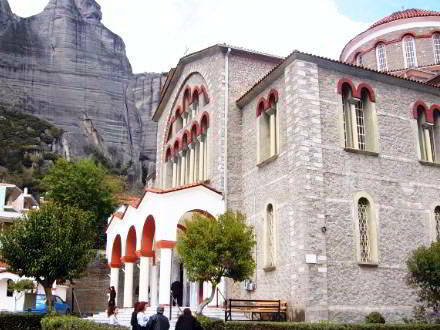 At its root is the small church of the Virgin of Doupiane, the center of worship of the first ascetics of Meteora. The church is in good condition and has beautiful old frescoes. 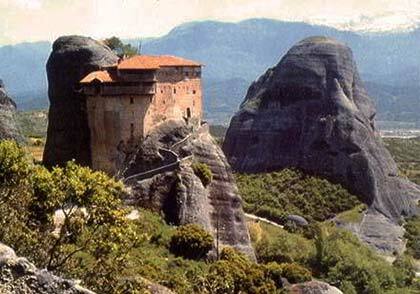 On the rock are the ruins of the monasteries of St. Demetrius and of Pantokrator. 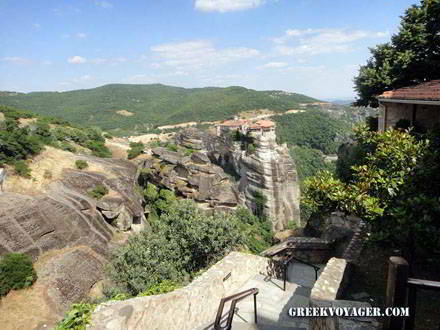 Climbing on the rocks of Meteora is a very old case. Long before the first hermits came, from ancient times the inhabitants fled to the rocks to protect themselves from the raids of bandits. The monks, who came after the 10th century, climbed in every way. Today's climbers find traces of climbing on very difficult rocks even for today. The climbing of the first hermit who ascended the rock Alyssos (Chain) had a very high degree of difficulty. The rock is still considered as one of the most difficult to climb. In the 14th century the Serbian Tsar Stephen Dusan ordered his soldiers to climb on the rock of the Holy Spirit and place on top a metal cross with dimensions 1.80 X0.80m. After six hundred years, in 1975, the cross came down with a helicopter and then is kept in the Monastery of Varlaam. There is also evidence that from old local shepherds and hunters climbed on very hard rocks. In our time until 1965 the community of Kastraki rented the tops of the rocks, where there was lush vegetation, to shepherds who carried their flocks to graze. 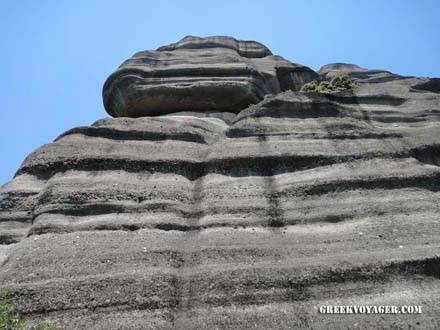 The rocks of Meteora began to be internationally known to fans of climbing in the 1970's. The sport of climbing began in Meteora when in 1975 came the great climber Dietrich Hasse and his friend professional photographer and climber Heinz Lotar Stutte. The next decade they opened over two hundred trails and climbed at the one hundred “towers” in the area. The two friends, who issued three climbing guides until 2000, are considered as the fathers of the sport of climbing in Meteora. They also gave an example to the youth of the region to get involved with climbing. Since the 1980's more and more Greeks and foreigners came to the climbing area of Meteora and international meetings and events took place. Nowadays Meteora is one of the most fascinating and safer climbing areas worldwide. All climbing schools provide at least a weekend in the area of Meteora. Also, there are companies that offer guided climbing, but also mountain biking and guided hikes. Climbers can climb in all rocks except those where are inhabited monasteries. More than one hundred “towers” and seven hundred trails offer thrills at every level climbers. All routes have been opened traditionally bottom-up, and have various degrees of difficulty, from easy to very difficult. The rocks are sand-stone composition with pebbles. So, there are natural grips, something very important for novice climbers. Experts recommend that beginners prefer the routes on the back side of the rock Doupiane. In the area there are trainers. We may ask for information everywhere. From Kalambaka we can make nice excursions to the west in Pindus and to the north in Chasia and Antichasia where there are traditional village, historic monasteries and wonderful mountain landscapes. 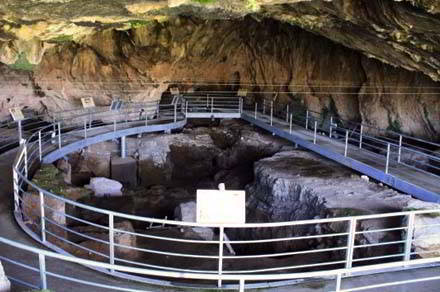 The Cave of Theapetra in the southeast near the village of the same name. 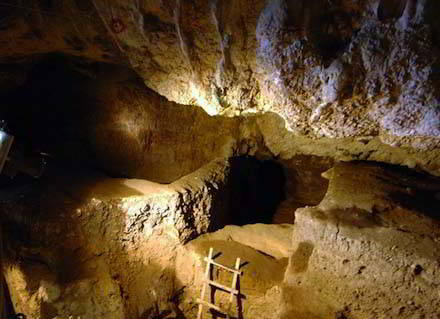 The archaeologists discovered traces of habitation from the Middle Paleolithic to the Νeolithic Age and four human skeletons one of which is 14500 years old and the other 7000 years old. They also discovered footprints from human feet 100 000 years old. 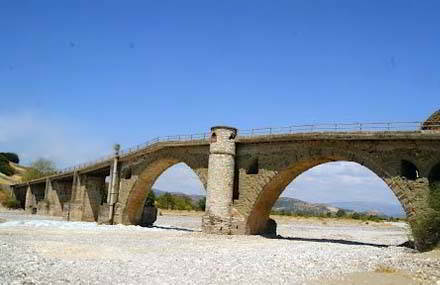 The bridge of Sarakena in the south. The stone bridge of the historic settlement of Sarakena was built in the 14th century; is the longest bridge in the region of Trikala with six arches, of which four are still exist. Many reconstructions for the needs of the earlier transportations, have altered the original construction, but the bridge is still impressive. In Kalambaka the art of iconography has been developed. Apart from the workshops, there are factories and manufactories which make icons. The type and cost of the icons depend mainly on the type of wood. There are also shops with folk art. The area is famous for its meat. Known is the “kebab” – roasted pieces of pork, lamb or ewe. From the traditional sweets famous are the “halva” and the “spatula” – a kind of pudding based in karydopita (walnut pie). From drinks we have to taste the tsipouro (raki) of Trikala with anise or other spices.